In the middle of the Sahara, a thoosand mile frae onie hoose or hame, a stranded pilot meets a young stravaiger from another planet, who asks him to draw a picture of a sheep. 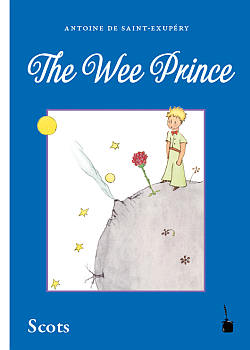 From this byordinar beginning, an unbreakable friendship forms, as the enigmatic Wee Prince reveals the secrets of his dowff an dowie life, his fondness for sundouns, his love for a wondrous bonnie but fykie rose - and his need for a sheep to keep the michty baobabs at bay! First published in 1943, Antoine de Saint-Exupéry’s moving and poetic tale is both timeless and timely, with its message that the things thatreally matter in life - the muckle maitters - are takkin guid tent of your hame planet, and cultivating the deep ties of friendship and love. Susan Rennie’s Scots translation perfectly captures the poetry and poignancy of the original and will be appreciated by both bairns and grown-ups alike. Dr Susan Rennie is a writer and lexicographer who has written and translated many books in Scots, including the award-winning Animal ABC: a Scots Alphabet and translations of Tintin and Roald Dahl. One of the co-founders of Itchy Coo Books, she has taught Scots language at the universities of Dundee and Glasgow, and is a former editor of the Dictionary of the Scots Language and director of the new Historical Thesaurus of Scots.